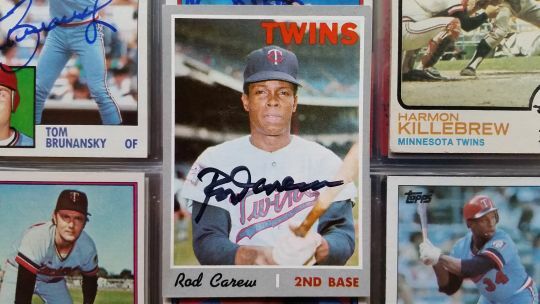 Rod Carew hit for the first cycle in Twins history in a 10-5 win in Kansas City. He completed the cycle with an eighth-inning triple, driving in Cesar Tovar. Carew was 4-for-5 with two RBI and two runs scored on the day. After Carew’s triple, St. Cloud Cathedral High School graduate and future-Twin Tom Burgmeier came in to finish the game for KC. 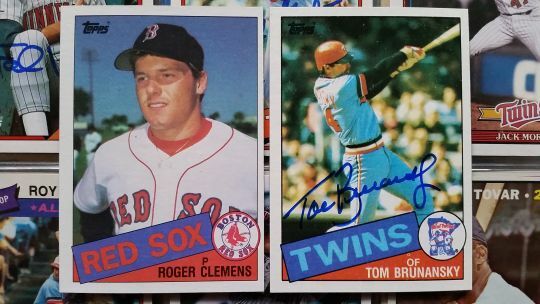 Ten Twins have hit for the cycle: Carew (1970), Cesar Tovar (‘72), Larry Hisle (‘76), Lyman Bostock (‘76), Mike Cubbage (‘78), Gary Ward (‘80), Kirby Puckett (‘86), Carlos Gomez (‘08), Jason Kubel (‘09) and Michael Cuddyer (‘09). In his second major league start, Roger Clemens earned the first of his 354 career victories, allowing four runs on seven hits and a walk over seven innings in a 5-4 Red Sox win at the Metrodome. With two out in the bottom of the sixth, Tom Brunansky hit the first of the 363 home runs that the Rocket would allow over his 24-year career. The Twins traded a player to be named later and cash to Oakland for pitcher Keith Atherton. The player to be named wound up being minor league pitcher Eric Broersma, who never made it to the majors. Atherton, on the other hand, pitched in 62 games for the 1987 Twins, including Games 1 and 5 of the World Series. 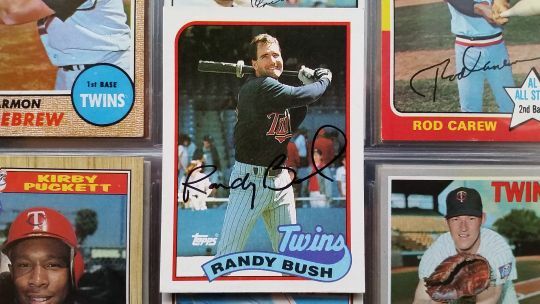 Randy Bush drove in a eight runs in a 19-3 win in Texas, tying the Twins' single-game record set by Glenn Adams on June 26, 1977. Six of those RBI came in the final two innings of the game, as Bush hit three-run home runs in the eighth and ninth. He was 3-for-4 with a walk, eight RBI (one on a sac fly) and two runs scored on the day. Leadoff hitter Dan Gladden tied a major league record with seven plate appearances in the game, going 1-for-7 with an RBI and run scored. Two players have driven in 12 runs in a game, both playing for the St. Louis Cardinals. Hall of Fame first baseman Jim Bottomley did so versus the Dodgers at Ebbets Field in 1924. And, in 1993, Hard Hittin’ Mark Whiten drove in 12 of the Cardinals’ 15 runs with four home runs, including a first-inning grand slam, versus the Cincinnati Reds. Already beating Boston 10-1 at the Metrodome going into the bottom of the fifth, the Twins sent 16 men to the plate, tying a team record established in the tenth inning on June 21, 1969. Alex Cole, the seventh Twin to the plate, made both the first and last outs of the inning. The Twins tied team records for runs in an inning (11), hits (10) and consecutive hits (8). 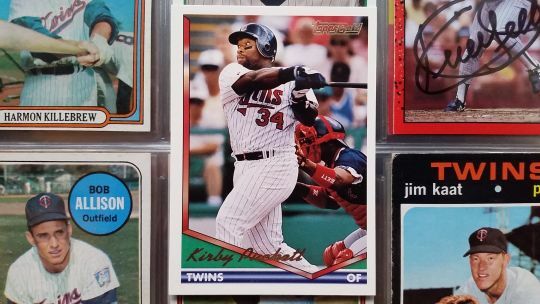 Kirby Puckett had a huge day, going 3-for-3 with a HR in the fifth, seven RBI and a run scored. DH Dave Winfield was only Twins starter without a hit. The Twins won 21-2, improving to 21-19 on the season. Marty Cordova tied a Twins record, homering in his fifth consecutive game as Scott Erickson and the Twins fell to Lou Piniella’s Seattle Mariners 10-6 at the Metrodome. Cordova would hit a career-high 24 home runs in 1995 en route to being voted the American League’s Rookie of the Year. Harmon Killebrew homered in five consecutive games on two separate occasions during the Twins’ 1970 Division Championship season. Twenty players have homered in at least six consecutive games. Barry Bonds is the only player with two such streaks, homering in six straight in 2001 and seven straight in ‘04. Jim Thome homered in seven straight for Cleveland in 2002. The major league record for consecutive games with a home run is eight. Pittsburgh’s Dale Long did so in 1956, followed by Don Mattingly in 1987, and Ken Griffey Jr. in 1993. Carlos Silva allowed just one run on five hits, no walks and three strikeouts in a complete game 7-1 Twins win over Milwaukee at the Metrodome. Silva needed only 74 pitches to complete the game, an average of 8.2 per inning. Second baseman Nick Punto wwent 4-for-4 with an RBI and run scored. The Twins had 16 hits as a team. The only Twin without a hit was Torii Hunter, though he did drive in Punto with a sac fly. Putting a silver lining around an otherwise sad situation, the Twins were in town to play the Arizona Diamondbacks and able to attend the funeral of Harmon Killebrew, who had passed away three days earlier. 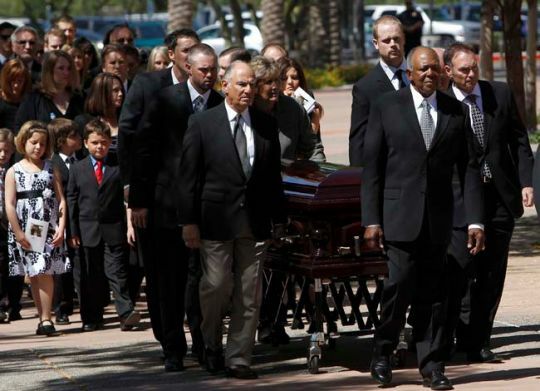 Bert Blyleven spoke at the funeral, while Rod Carew, Tony Oliva, Frank Quilici, Joe Nathan, Michael Cuddyer, Justin Morneau, Ron Gardenhire and Paul Molitor served as pallbearers. Trailing 16-4 in Milwaukee, Ron Gardenhire called on Drew Butera to pitch the bottom of the eighth. Butera pitched a scoreless, hitless frame, walking one and striking out Carlos Gomez. Drew threw several pitches in the 90s, topping out at 94 on the radar gun. While playing with the Dodgers in 2014, Butera pitched a 1-2-3 ninth inning versus the Miami Marlins. He pitched again for Los Angeles just three days later, this time giving up a two-run HR to Paul Goldschmidt as he recorded the final two outs of the game. 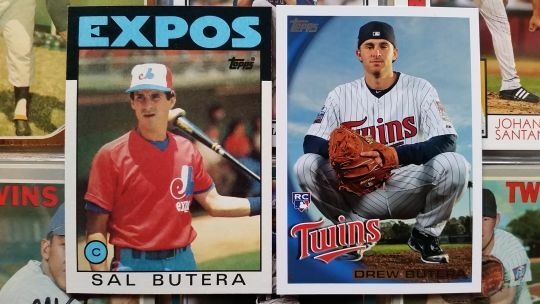 Drew’s dad, fellow catcher Sal Butera, did not allow a hit in his two major league pitching appearances. He pitched a 1-2-3 inning in his big league pitching debut for Montreal in 1985. In 1986 he pitched a scoreless ninth for the Cincinnati Reds, walking one and striking out one. Happy 57th Birthday, Kent Hrbek! 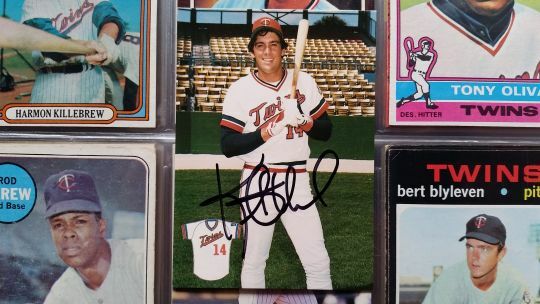 It's the birthday of 1978 Bloomington Kennedy graduate Kent Hrbek, born in Minneapolis in 1960. The Twins drafted Hrbie in the 17th round out of high school. 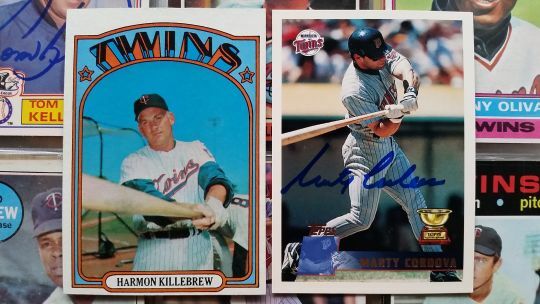 Only Harmon Killebrew and Kirby Puckett have played more games in a Twins uniform. The big 6'4" first baseman made his major league debut on August 24, 1981 at Yankee Stadium, hitting a game-winning home run off of George Frazier leading off the twelfth. Hrbek made his only All-Star team in 1982, and finished second to Cal Ripken, Jr. for American League Rookie of the Year. Hrbek drove in 107 runs in 1984 and finished second to Tigers pitcher Willie Hernandez for American League MVP. He hit three grand slams in 1985, tying Bob Allison, Rod Carew, Kirby Puckett, and Torii Hunter for the Twins' single season record. The 34 home runs Hrbek hit in 1987 are the most ever by a Twins lefty. His grand slam in Game 6 of the 1987 World Series is an iconic moment in Twins history. His reaction after catching Gary Gaetti's throw for the final out of Game 7 is immortalized in bronze outside Gate 14 at Target Field. Hrbek retired following the strike-shortened '94 season. His 239 HRs and 1,086 RBI are second in Twins history to only Harmon Killebrew. His 1,749 hits rank sixth behind Kirby Puckett, Harmon Killebrew, Rod Carew, Tony Oliva, and Joe Mauer. The Twins retired Hrbek's #14 on August 13, 1995. Cesar Tovar had the Twins' first four-extra-base hit game in a 12-3 win versus the Angels in California. Tovar, the Twins' leadoff hitter, hit two doubles and two HRs. He went 4-for-6 on the day, improving his batting average to .323. Tony Oliva went 3-for-4 with two doubles. Oliva would lead the American League with 34 doubles, with Tovar coming in second with 32. Kirby Puckett (1987 and '89), Rich Becker (1996), Corey Koskie (2001) and Michael Cuddyer (2005) have since tied Tovar's record of four extra-base hits in a single game. Eight players in major league history have hit five extra-base hits in a game. 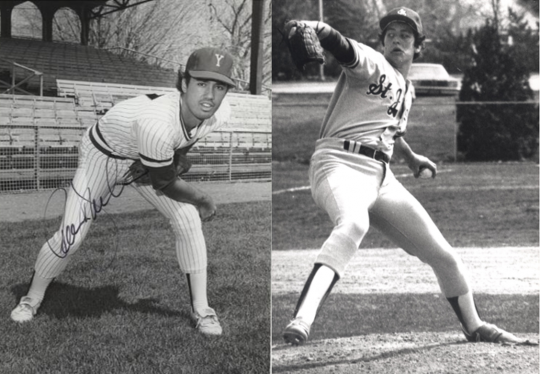 After Yale's Ron Darling pitched 11 no-hit innings, Frank Viola and St. John's University win it in the twelfth. The Twins snapped a six-game losing streak, beating the White Sox 20-1 in the series finale in Chicago. The Twins collected 20 hits and five walks in the game. Bartolo Colon took the loss, giving up eight runs on seven hits and two walks in just two innings. Michael Cuddyer went 4-for-6. Designated Hitter Joe Mauer hit a grand slam in the Twins' six-run sixth inning. It was already his eighth home run of the season. He would go on to hit 28 in 2009 en route to being voted the American League's Most Valuable Player. Keep in touch with @TwinsAlmanac on Twitter.